The Pearl Dish is a handcrafted object in the heart of your home or workspace. The Pearl Dish is inspired by the story of a girl named Pearl, who wouldn’t put down her phone. Wanting to take a step back from technology, her parents came up with the idea of a designated place to house it during family time. 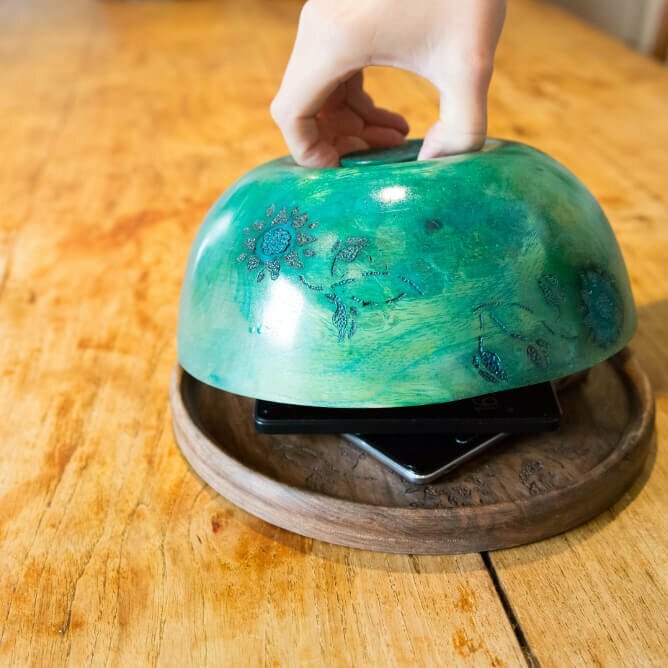 This story resonated with Gillian Scott, founder of Craft Design House, and led her to design The Pearl Dish, a striking solution to the challenges many of us face with technological boundaries. 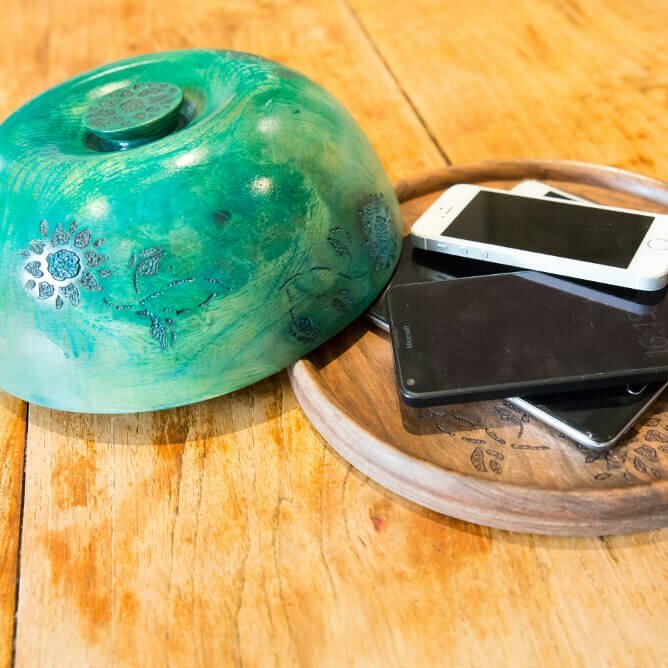 The Pearl Dish gives us a place to round up, park or put a lid on our technology and creates the space we need to listen and converse, away from its glare and interruption. It is designed to encourage face-to-face interaction as a conduit to conversation and as a talking point in itself. 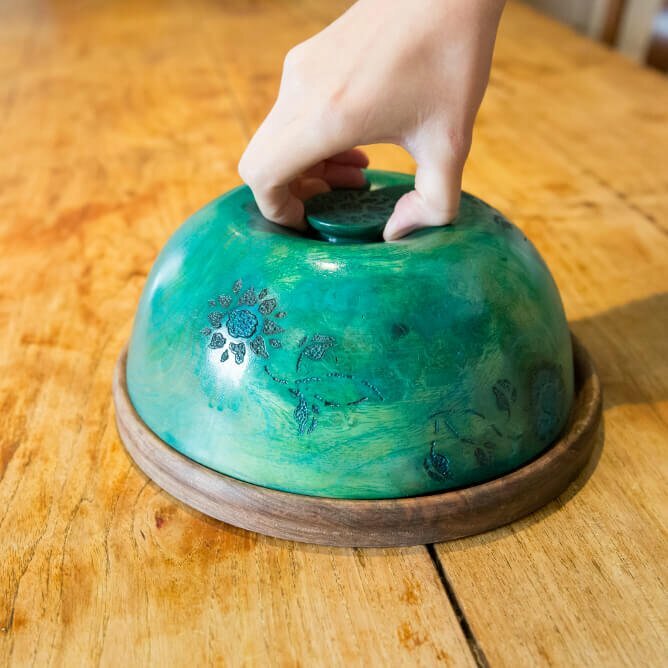 Craft Design House has commissioned designers and makers across a variety of disciplines to interpret The Pearl Dish in their own materials and style. 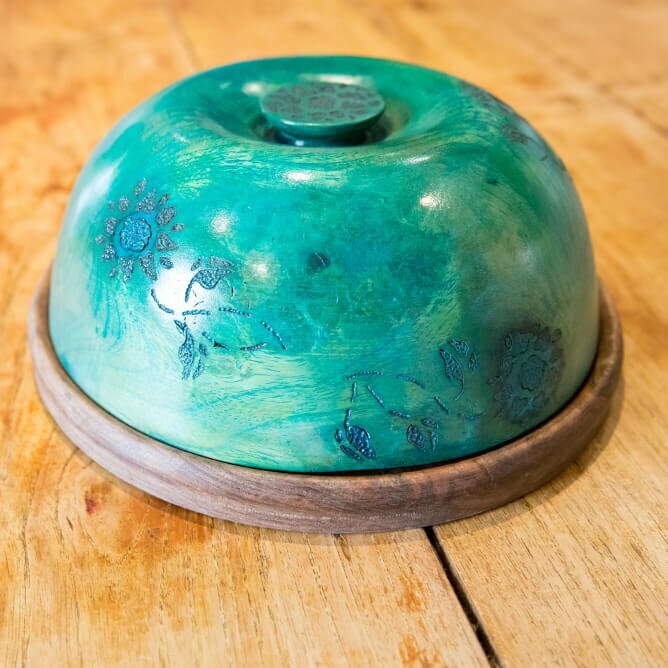 This Pearl Dish has been designed and created by Patricia Spero and Gabor Lacko in their studio in Essex, inspired by the by the textural hidden depths and colours of wood. They aim to bring out the inner patterns and shapes of the once living and breathing substance and enhance them through their work. 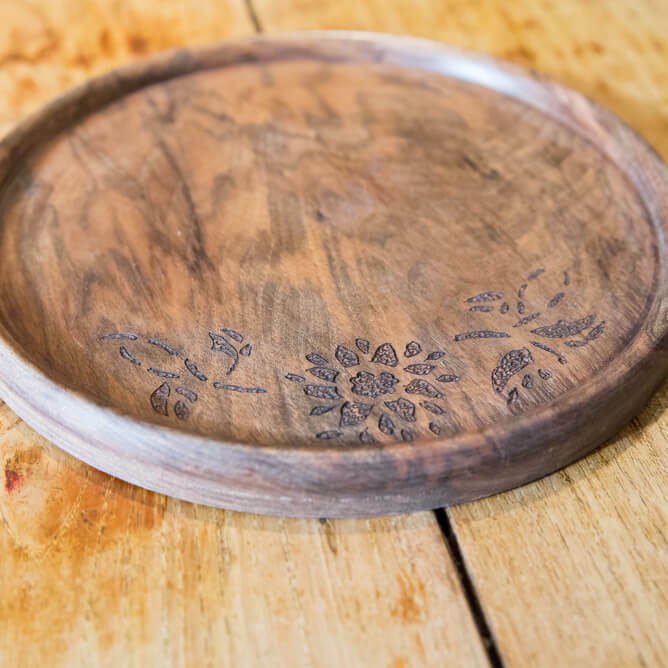 They carefully choose the wood for each Pearl Dish and are inspired by the texture and markings of the unturned wood. 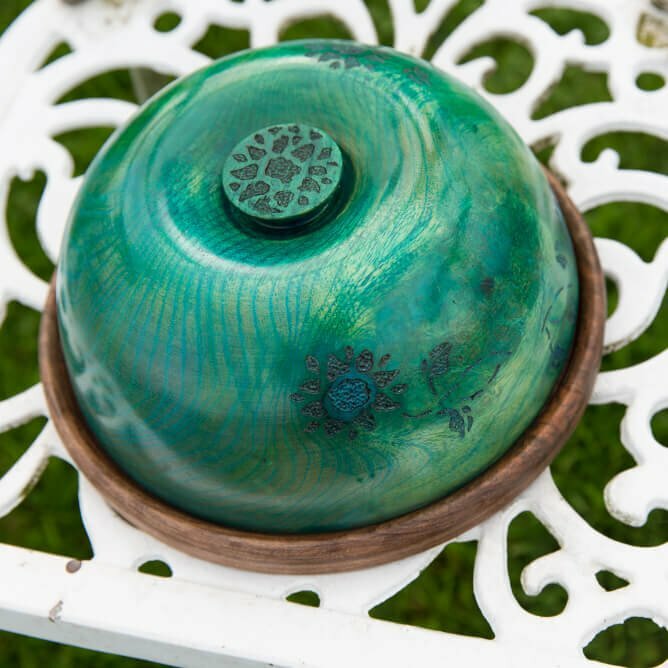 They like to leave any very beautiful natural markings uncoloured, and texture and sometimes colour the growth lines of other pieces. The decorative leaves and flowers are applied with a Presto Dental Drill and the colour is applied using an airbrush. The typical lead time is one week. We have always been inspired and fascinated by the by the textural hidden depths and colours of wood. We aim to bring out the inner patterns and shapes of the once living and breathing substance and enhance them with our own designs. 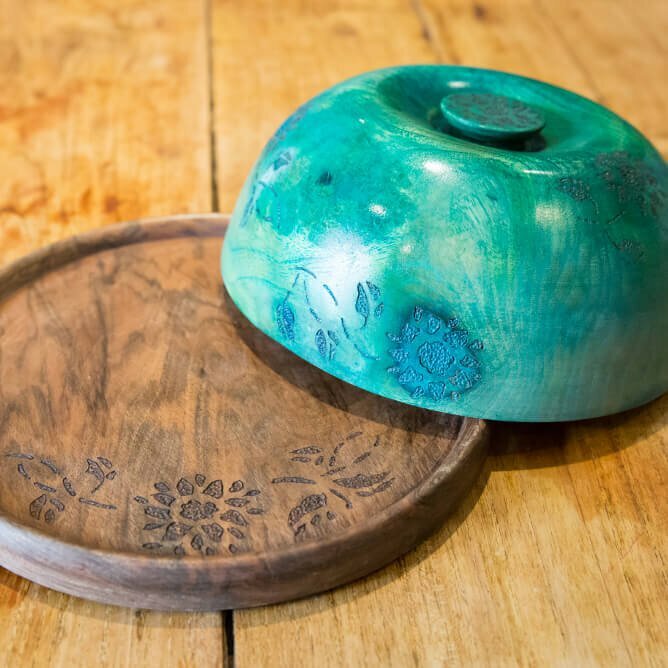 We work mostly in sustainable English woods, and we make purely decorative objects which are firstly lathe turned by hand, then carved, pierced, inlaid and sometimes coloured. Our inspiration is nature, using the colours and shapes of leaves flowers and trees throughout the seasons to express the beauty of the natural world. We have been collaborating for eight years and have work in many major galleries, both here and abroad. Patricia’s background is in music, and Gabor’s is in engineering.